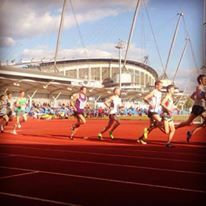 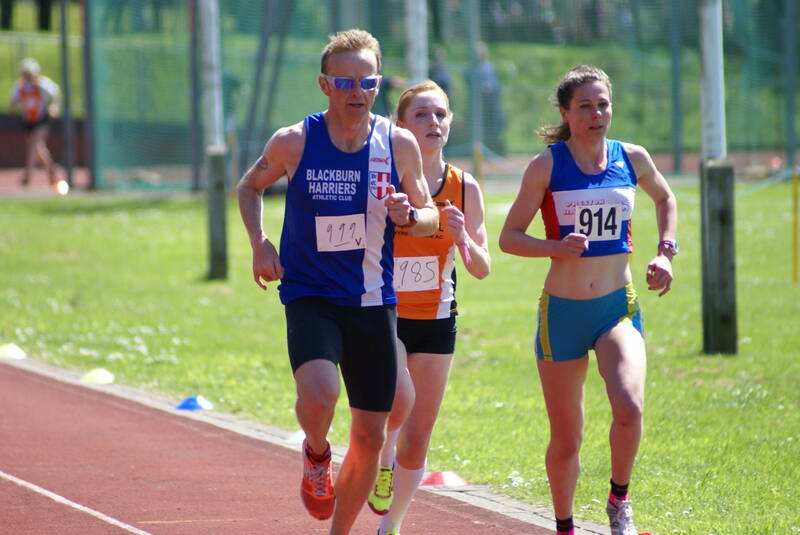 It was a huge new PB for Rob Warner at the BMC on Saturday night when he placed 8th out of 16 athletes in the 5000m, cutting a massive 22 seconds off his previous best time to set a new mark of 14.49.33. 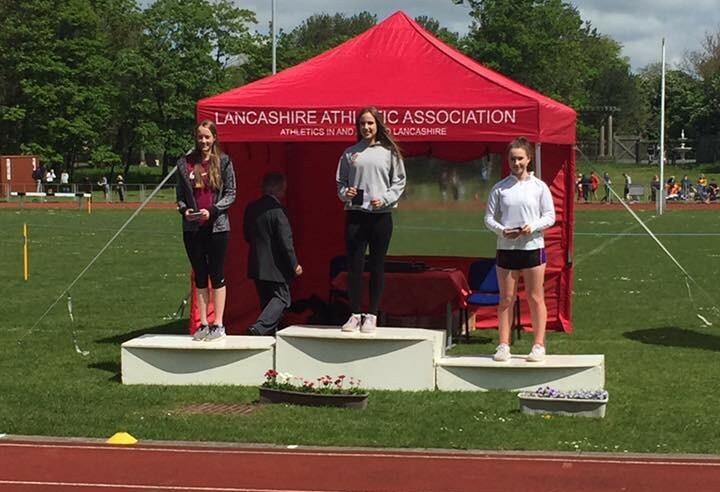 A great start to this years Championships with sunshine and a ‘nippy wind’ the background to new Championship best performances for Jacob Roberts in the Hammer, winning with a throw of 66.10m and for U13 Myah Booth who won the U13 70m Hurdles in a time of 12.0sec after winning her Heat in 12.1. 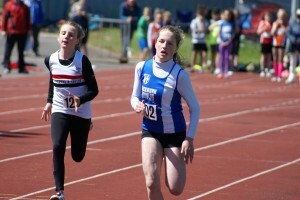 For Myah, that wasn’t the end of the day as she went onto win a second Gold Medal in the U13 Javelin with 22.93m. 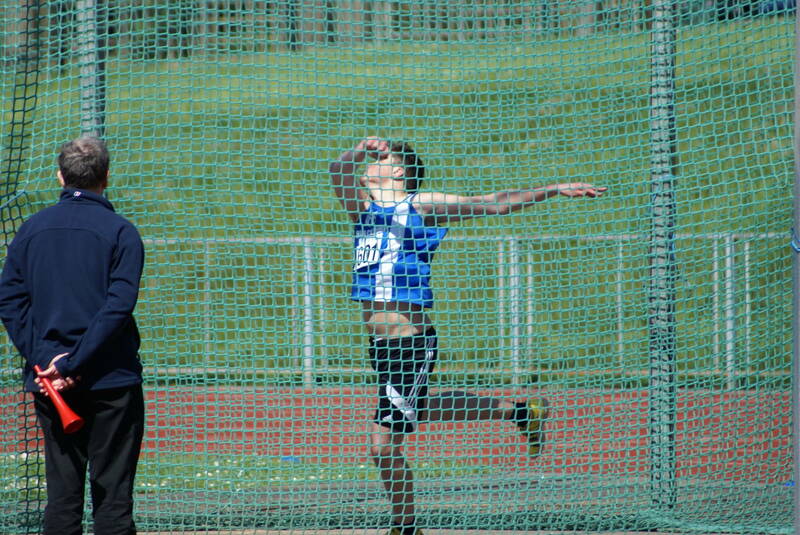 Anthony Kent had a good Championships in the U17’s winning the Discus with a throw of 34.14m, won a Bronze Medal, setting a new PB in the Hammer with 42.32m and yet another new PB in the Shot Putt (11.29m) final making it a Gold and two Bronze Medals on the day. 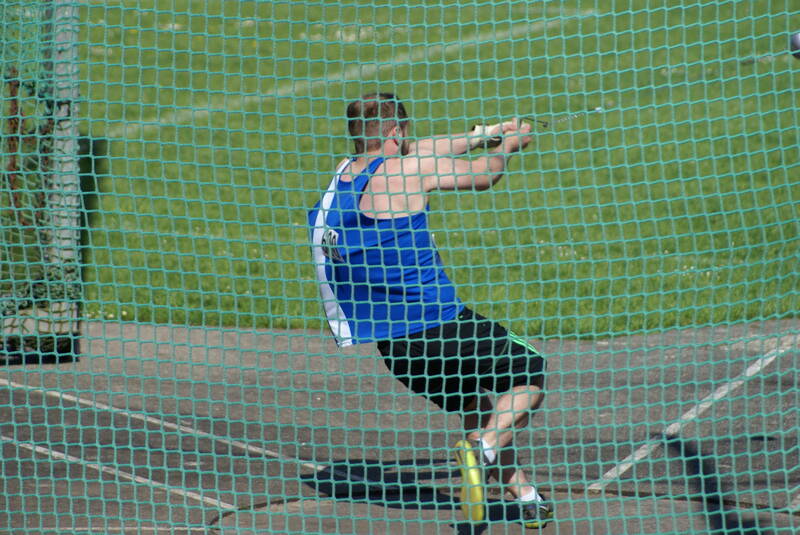 There were more new PB’s and Medals in the Throws with Cameron Massey setting a new Shot Putt PB (10.71m) and Connor Davison winning Silver in the Discus and putting 5 metres onto his new PB (31.51m) before winning another Silver in the Shot Putt (10.92m). 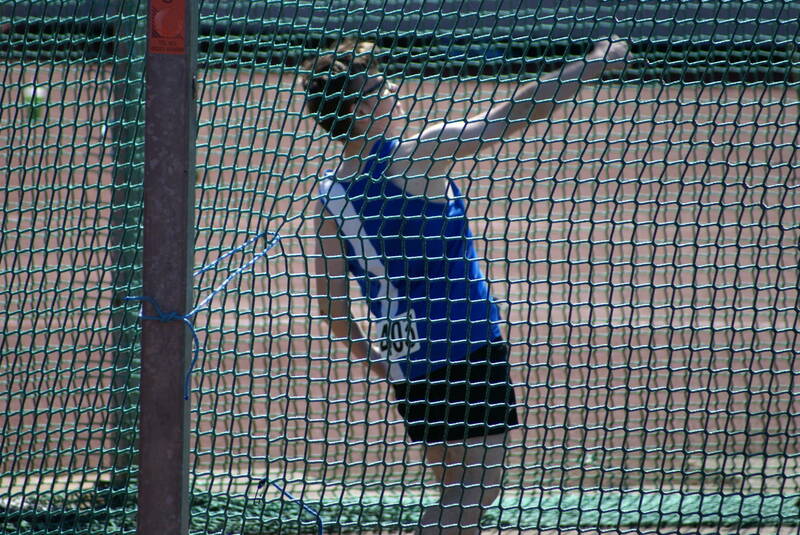 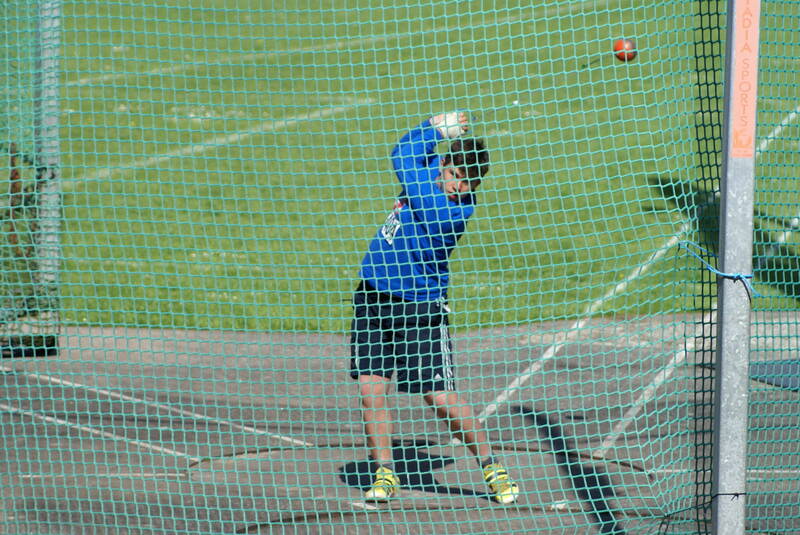 Alex Bernstein Won a Gold Medal in the U15 Discus (6.87m) and then took Silver in the Hammer with a new PB of 37.40m whilst Lucas Davies threw a distance of 22.62m in the U17 Discus Final. 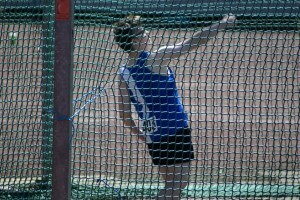 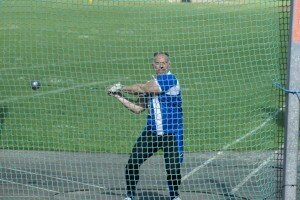 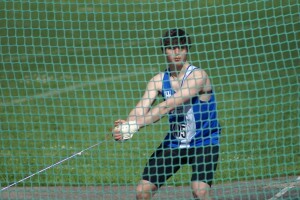 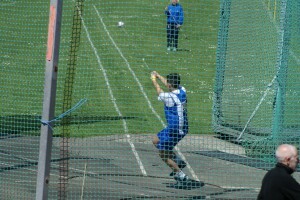 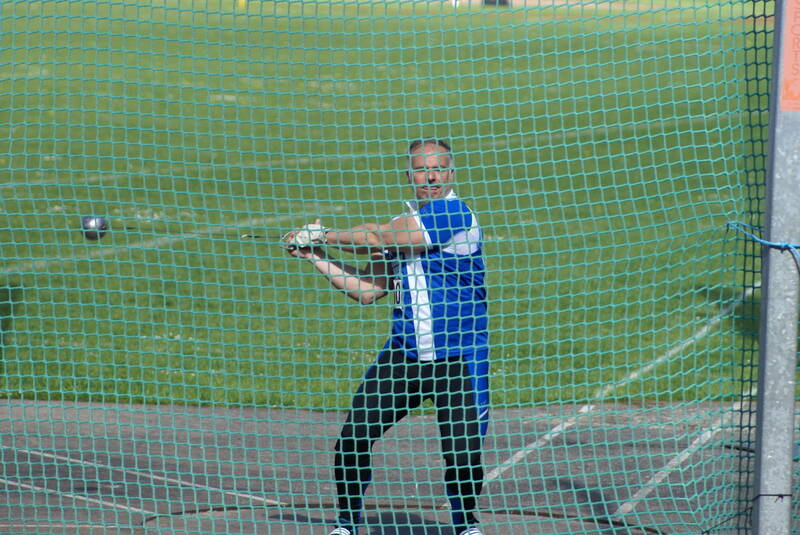 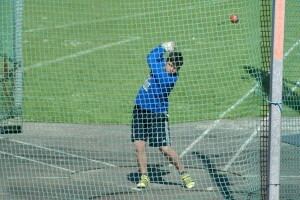 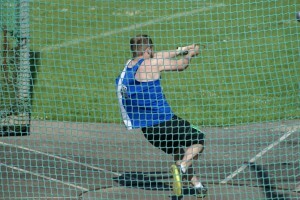 There were Silver Medals for Tony Balko (Senior Hammer) with 32.30m and U20 Nathan Billington with 39.37m. 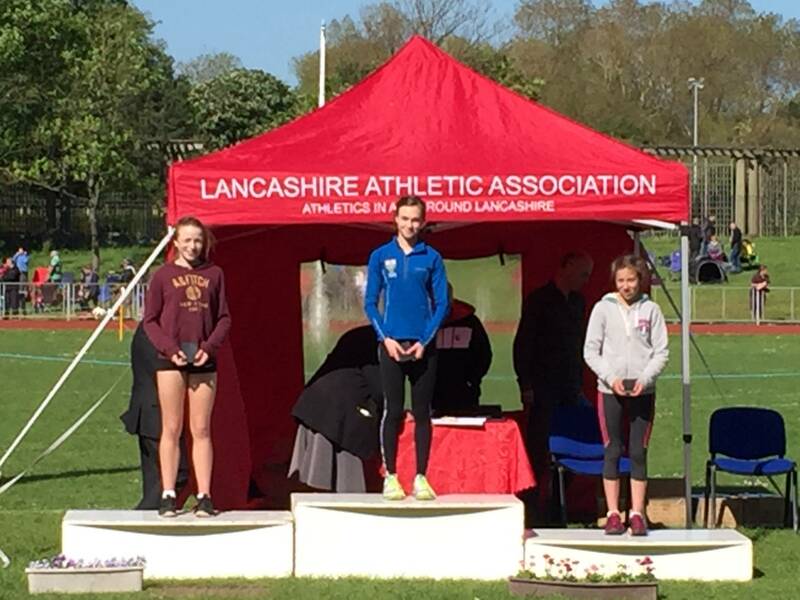 Eloise Littlefair had the one event in the day and made the most of it, adding over 5m to her previous best mark in the Javelin with a new PB throw of 31.00 and a Silver Medal. 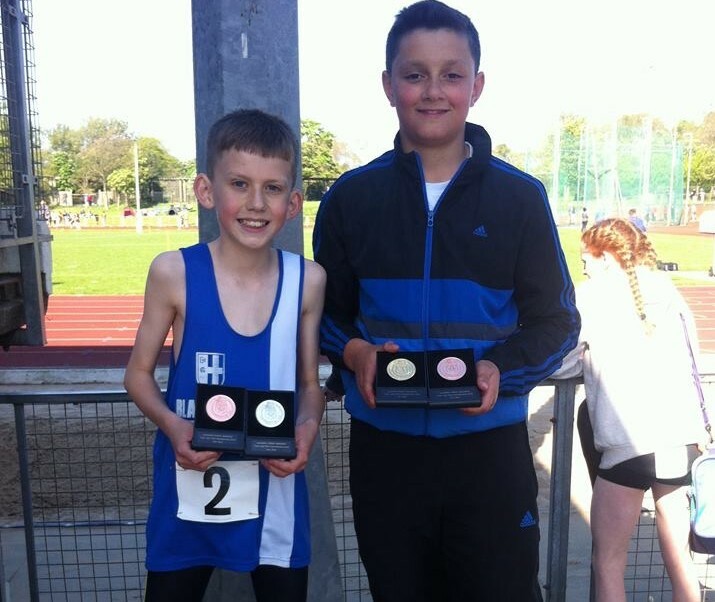 U13 Kyle Taylor-Pomfret was also among the medals in the U13 Throws taking Silver in the Hammer (15.12m) and also in the Discus with 12.23m. 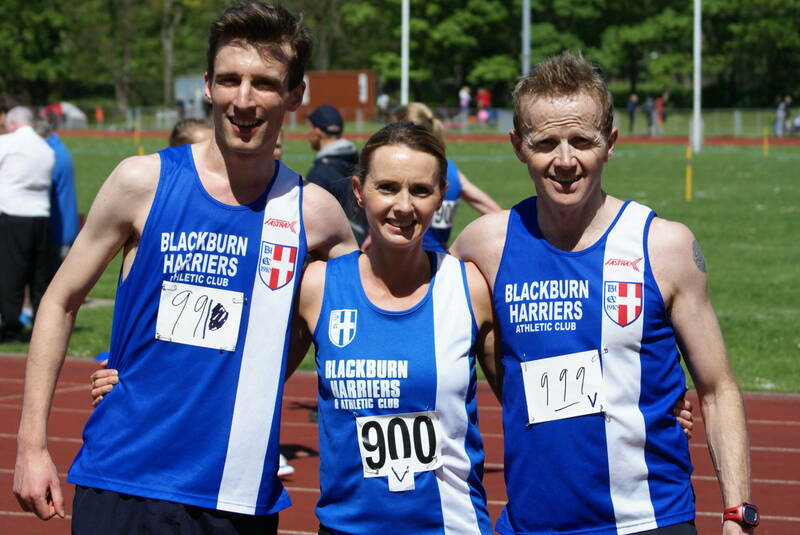 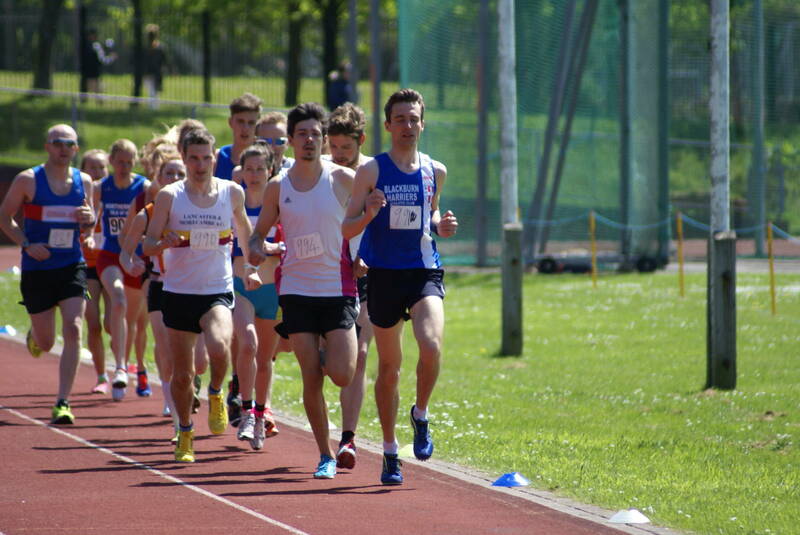 The 5000m produced a number of winners for the Club with Tim Raynes winning in a time of 15.43.7 following a cat and mouse race with second placed Josh Ingham from Pendle and pulling away to win by over 20 seconds. 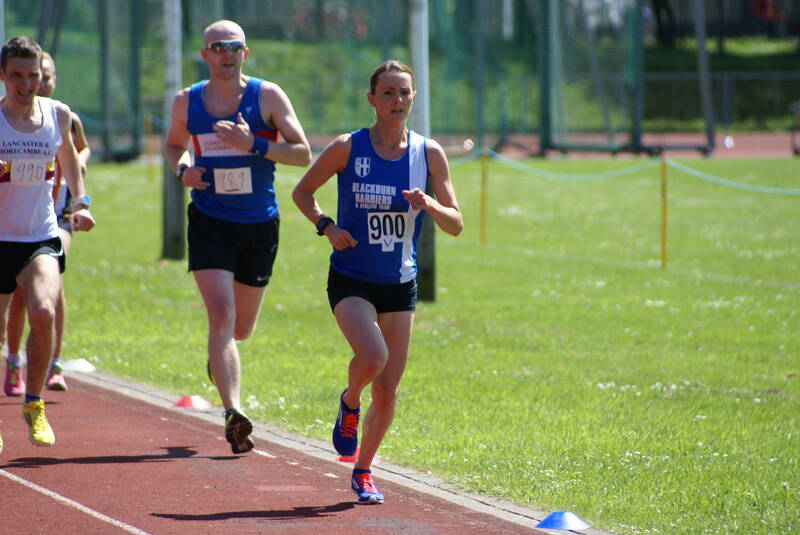 V45 Shaun Livesey took the Gold Medal in the Men’s Vets race with 16.58.4 and Christina Singleton took the Silver Medal in the Vet Women’s race in 18.23.4. 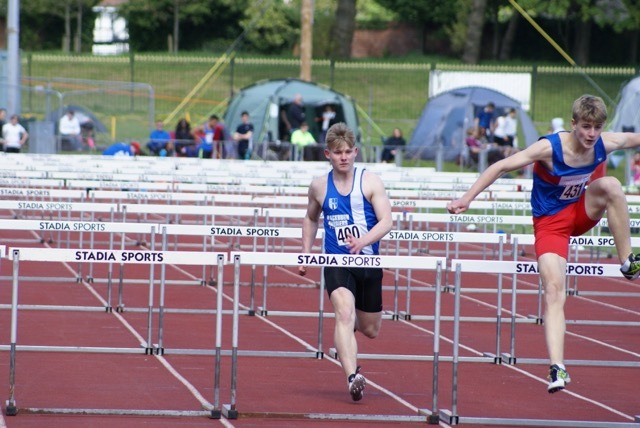 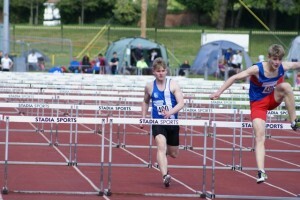 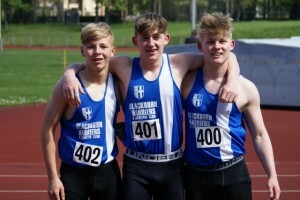 U17 Nick Massey continued the good performances on the day with a seasons best in the 100m (12.20), winning the 100m Hurdles in a new PB time of 14.5 whilst brother Cameron Massey also U17 set a new PB of 12.0sec in the 100m and another new PB in the 100m Hurdles (3rd) in 15.7. 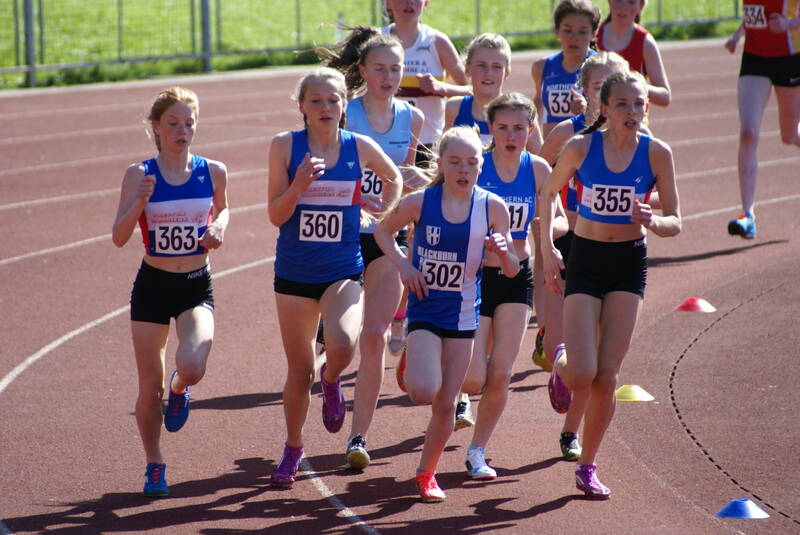 Hannah Cookson and Natalya Irvine had seasons bests in the U17 1500m with 5.15.0 and 5.17.9 respectively, whilst Charlotte Corrigan also set a seasons best in the U13 1500m with 5.32.6. 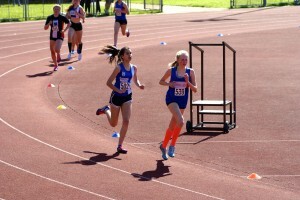 Amy Davies came in 9th in the U15 1500m in a time of 5.18.0 and Maddie Elliott who is going from strength to strength took 2nd place in the U17 1500m with a new PB of 4.54.8. 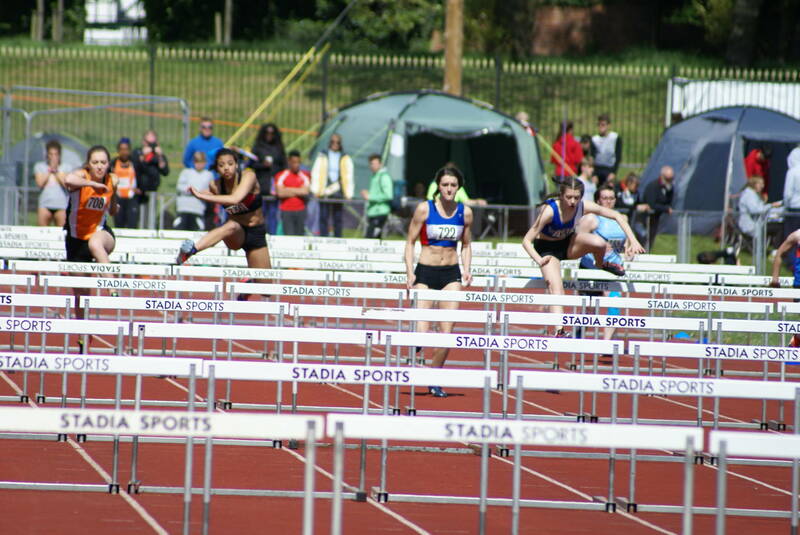 Among the batch of personal bests being won by the Harriers was Morgan Angland who took Bronze in the 100m Hurdles with a new PB of 15.6 and is experiencing her first season at the new distance. 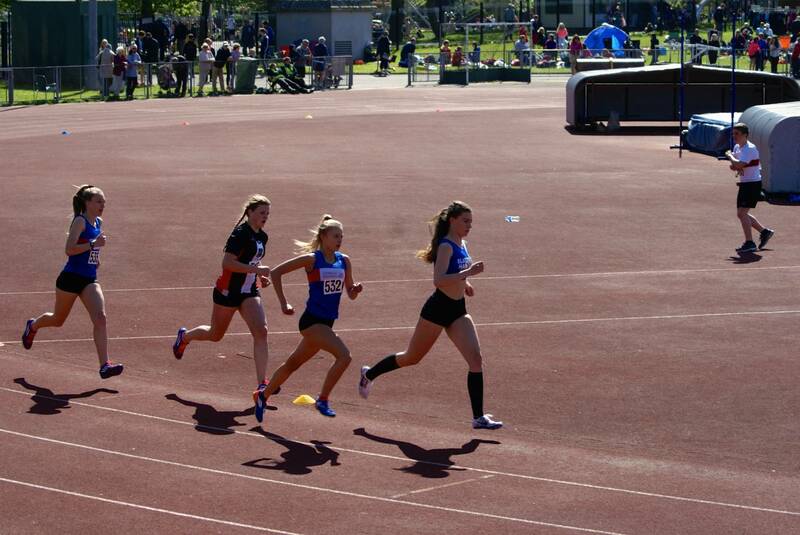 The new PB’s kept coming with U17 Chloe Bleeks setting PB’s in the 100m (13.6) in her Heat and 46.4 in her Heat of the 300m with the 100m also seeing Christie Sturgess set a new PB of 14.4. 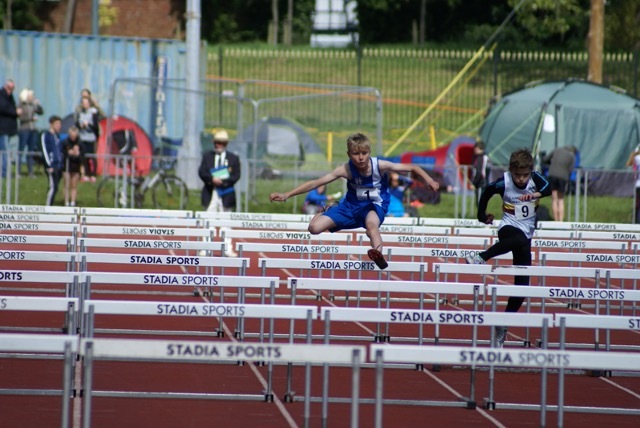 U13 Rory Teare was among the medals in the 75m Hurdles (15.5) which was a new PB and a second faster than he had run before and added a Bronze Medal in the High Jump with 1.30m. 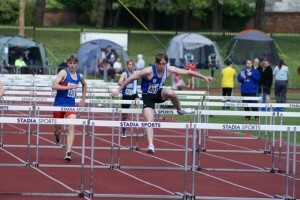 U17 Josh van der Linde set new PB’s in 100m H final (4th) in 18.7 and won the Silver Medal in the High Jump clearing 1.45m. 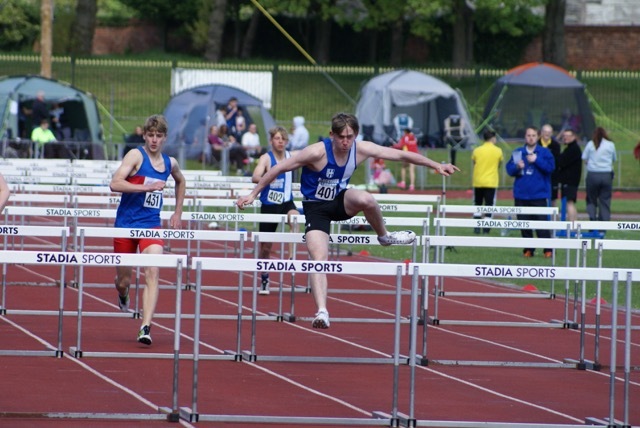 U15 Jamie Teare is firing at the moment and knocked seven seconds off his 1500m time for a new PB of 4.47.2 and a Bronze Medal too boot and went on to set a new PB in the HIgh Jump with 1.45m. 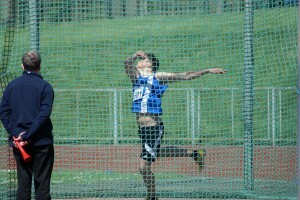 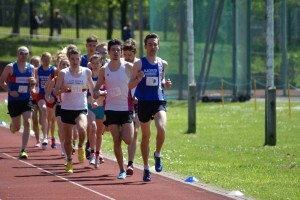 Come Sunday and Day Two with another Championship Best Record, more wins and new PB’s. 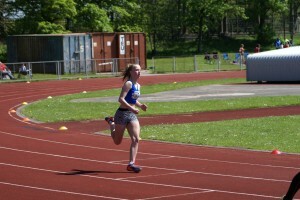 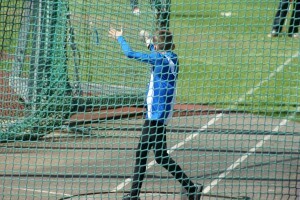 U15’s Charlotte Williams and Eloise Littlefair took on Hammer, Shot and Discus. Charlie got off to a great start setting the third Championship best by a Blackburn Harrier at this years Championships in the Hammer, winning with a throw of 51.30m and going on to win Bronze in the Discus (24.72m) and placing 5th in the Shot Putt (9.43m). 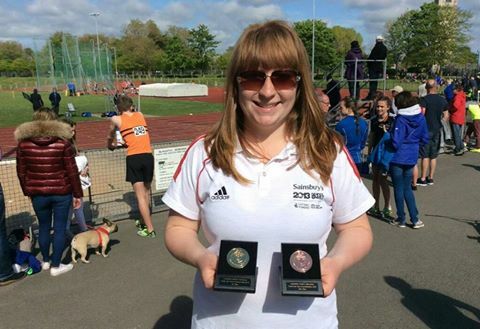 Eloise took medals in all of her disciplines winning the Shot Putt with a throw of 10.50m, winning the Discus with a new PB of 27.66m and took the Bronze in the Hammer reaching 25.78m. 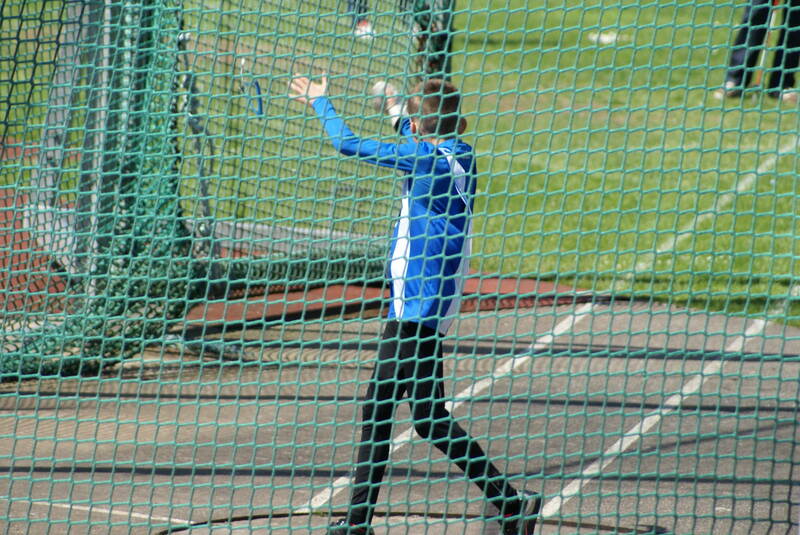 Rebecca Orrell took on the Shot Putt winning a Bronze Medal for a throw of 8.56m but it was in the Hammer which she won, throwing 41.20m that was remarkable. 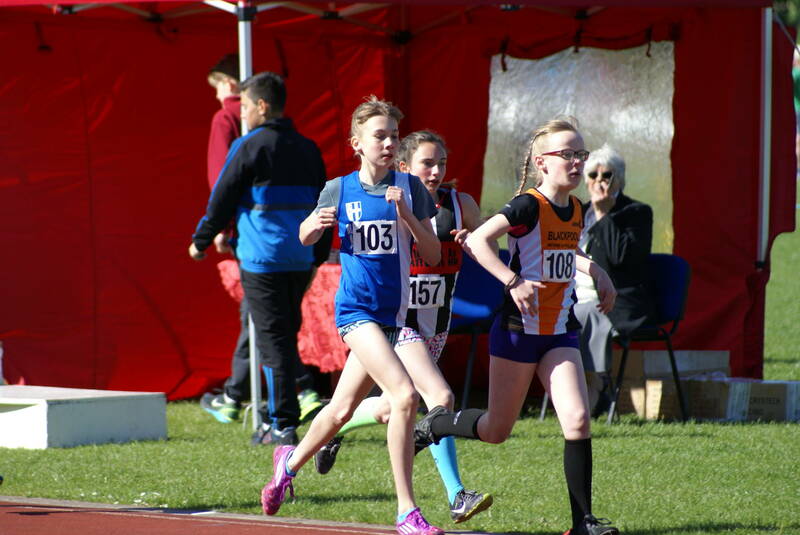 This was the fifth year in a row that Rebecca had won the County Championships in the Hammer in all the different Age Group categories. Maddie Elliott is another young athlete in real good form. 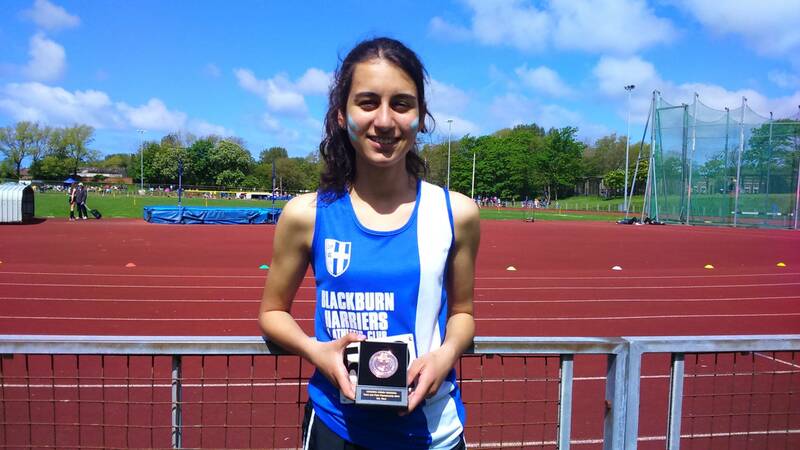 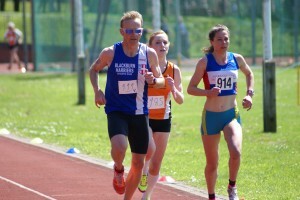 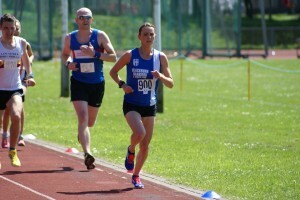 On the second day she won the 3000m in a new PB time of 10.43.00 chopping 5 seconds of her previous best and adding this to her Silver Medal won in the 1500m posting a new PB by 5 seconds. 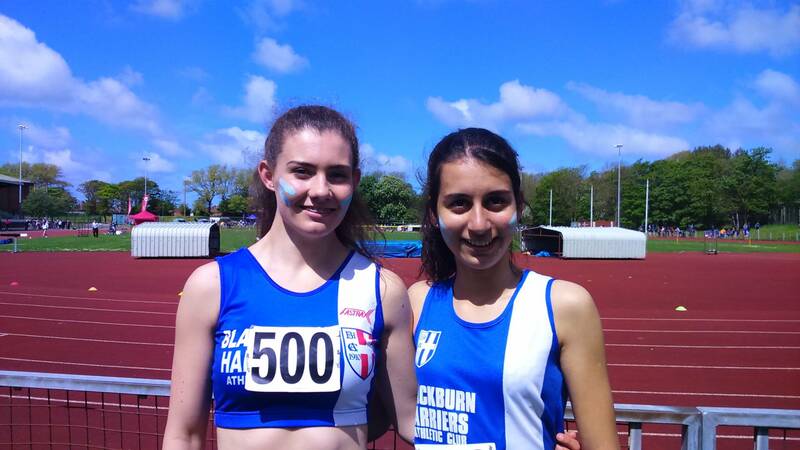 Hannah Cookson and Natalya Irvine had run the 1500m on Saturday and took on the 800m on Sunday finishing 3rd (2.26.6) and 6th (2.34,5) respectively earning Hannah a well deserved Bronze Medal. 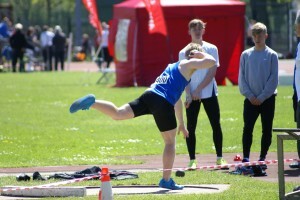 Natalya was just half a second outside of her PB and went on to win a Silver Medal in the Shot Putt with 8.77m. 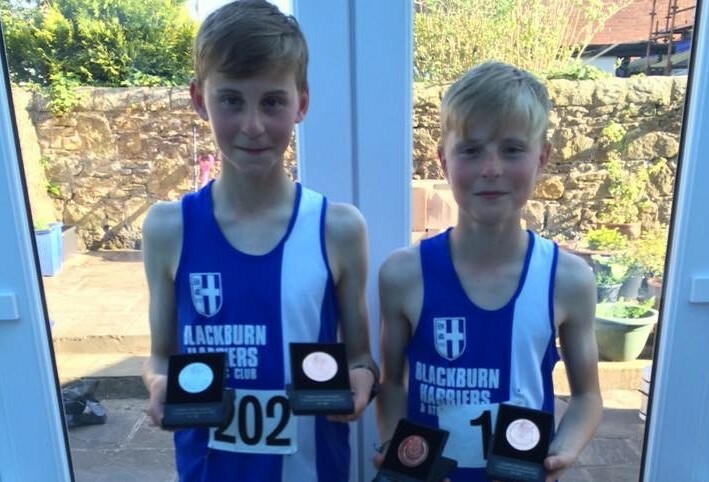 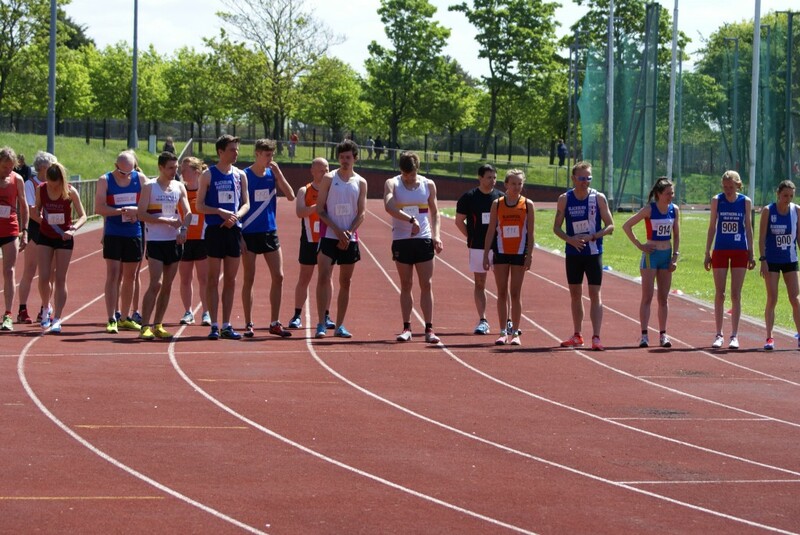 U15 Matt Ramsden who ran the 1500m on Saturday not feeling well, rebounded on Sunday to take a Silver Medal in his first ever 3000m race with a time of 10.03.5. 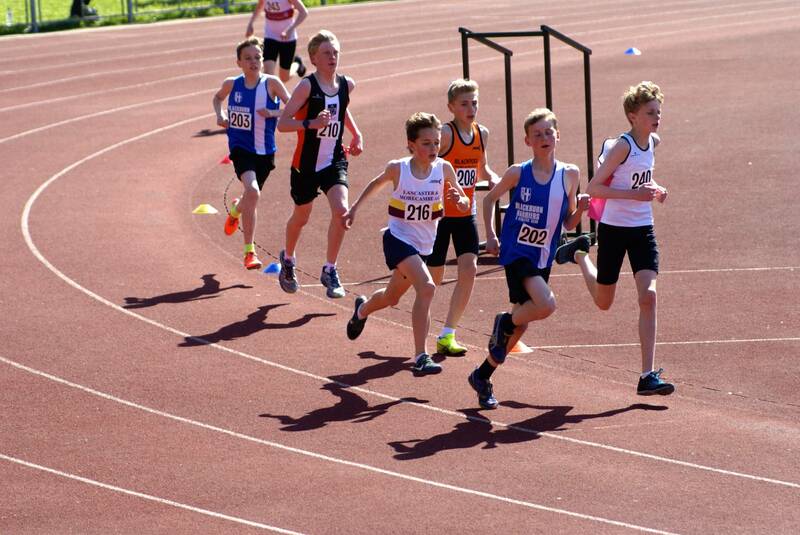 U15 Leon Thomas was in a pretty tasty 800m Heat and came home with a time of 2.28.0, a time just a second away from his PB. 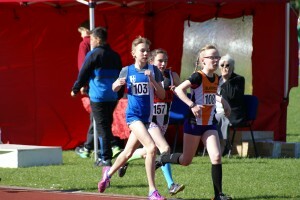 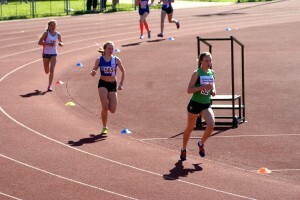 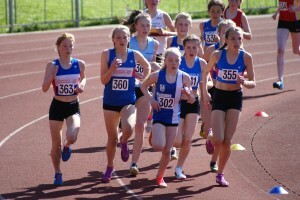 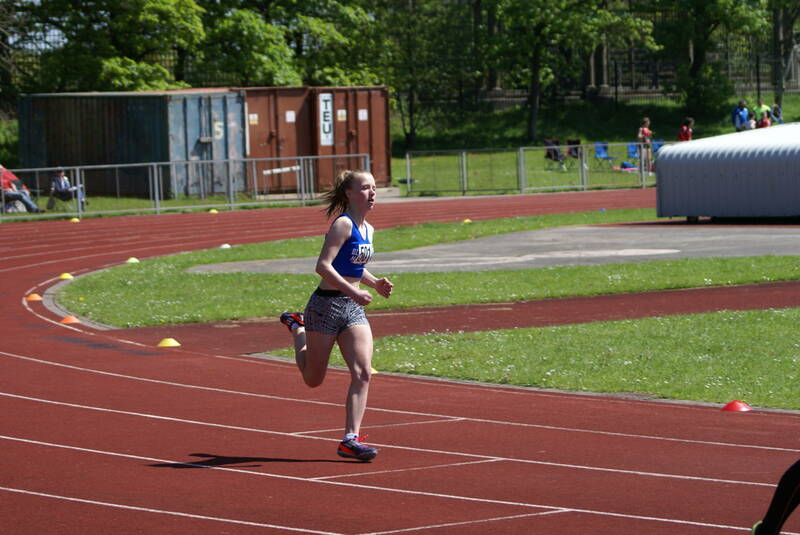 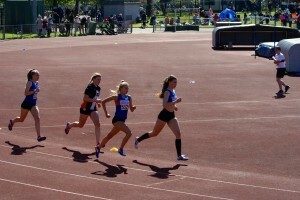 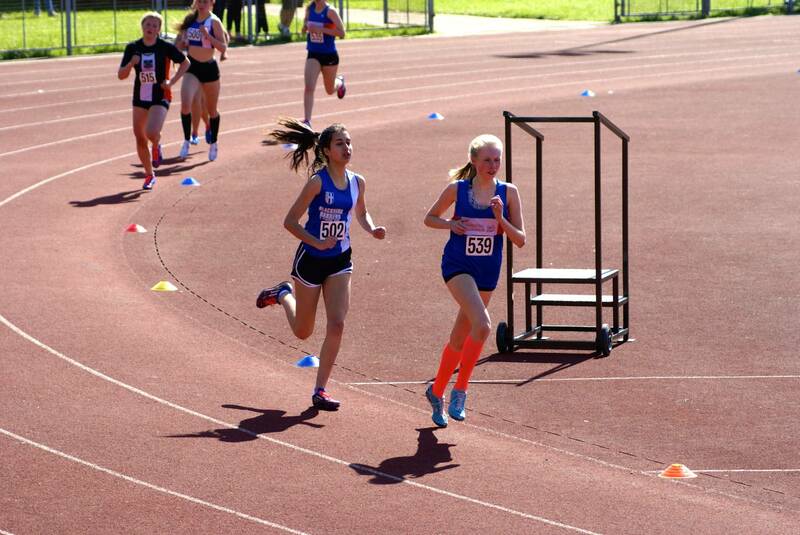 There were a few debuts at the Championships for the Harriers with U15 Liberty Thompson running 31.2 in the 200m Heat which equaled her PB, ran 2.44.8 in her 800m Heat and fell just 10cm short of her Shot Putt best with a throw of 5.25m. 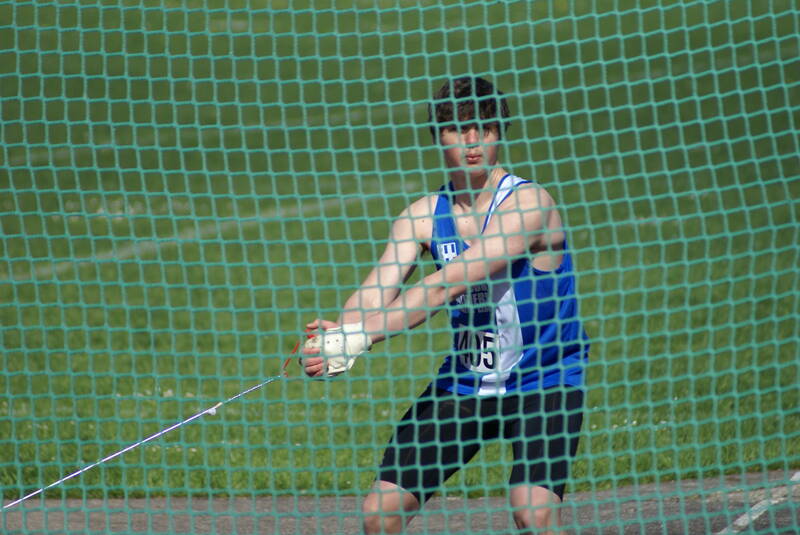 U15 Cameron Harris in his first ever competitive season and at his first Championships set a new PB of 32.30m in the Javelin to take the Silver Medal. 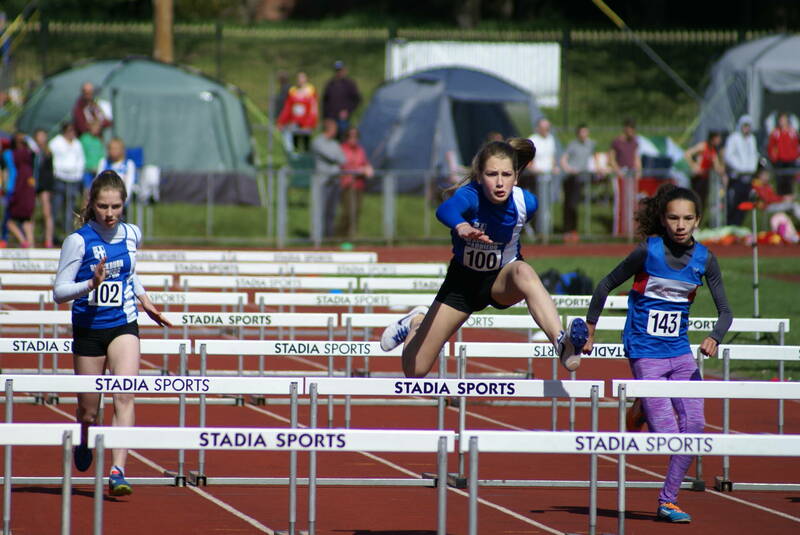 It is always a joy to see new young athletes get stuck in for the first time in a Championships which can sometimes be pretty daunting. 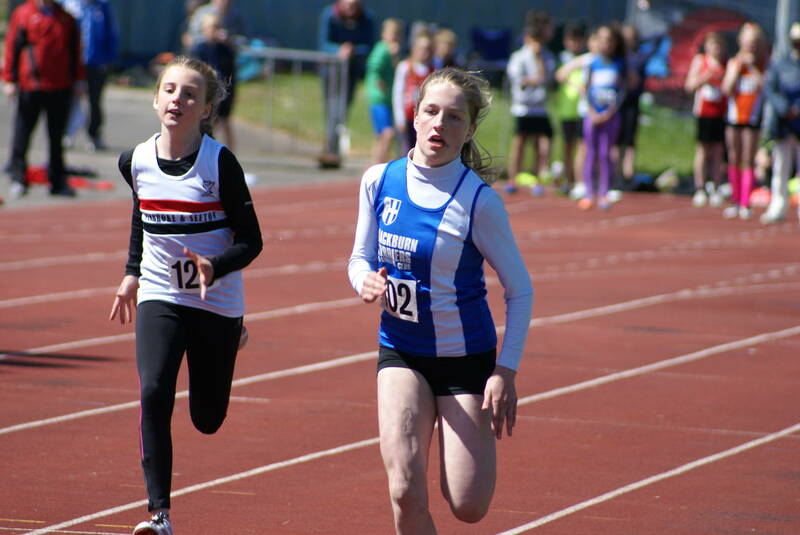 Caterina Lombard (U13) was another of the debutants who ran 43.1 in the 200m Heat, threw 3.71m in the Shot and 14.35m in the Discus. 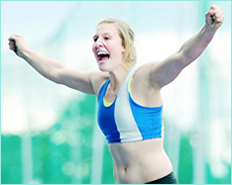 After winning two Gold Medals and setting a Championship Record on Day One, Myah Booth was back for an attempt in the Shot Putt where she picked up another Medal – Silver – in 2nd place with 8.68m and just centimetres away from another PB. 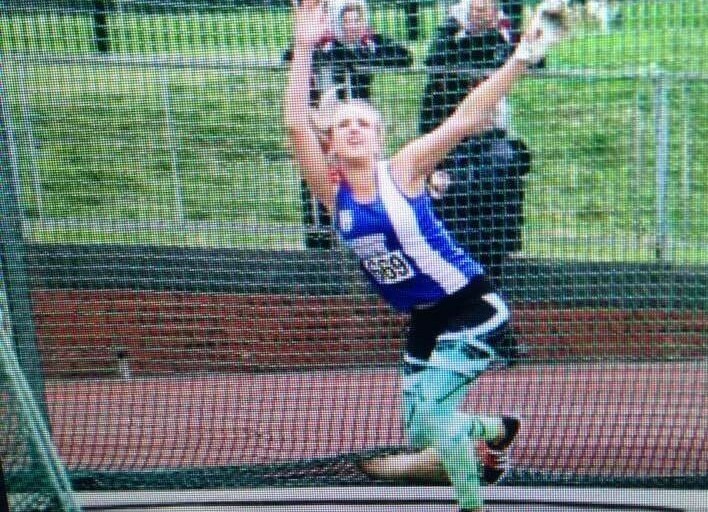 Chloe Bleeks had set two new PB’s on Saturday and took on three more events on Sunday in the Shot in her first ever competitive attempt where she was 4th (7.06m), 200m (8th) in a time of 28.2 after running 28.3 to qualify for the Final and 5th in the Triple Jump and another event she was attempting for the first time with a distance of 8.74m. 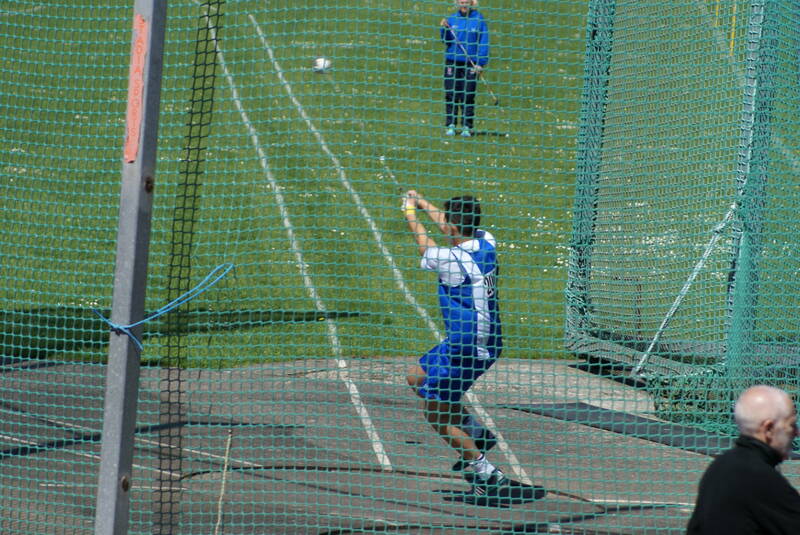 Cameron Massey, Josh van der Linde and Lucas Davies all contested the U17 Javelin on Day Two with Cameron placing 5th (30.76m), Josh 7th (25.40m) which was his first competition in the Javelin and Lucas came 9th with 24.0m. 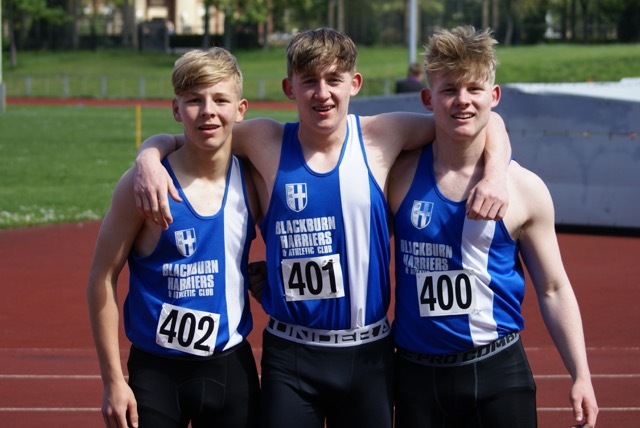 Moving on to the 200m Cameron set a new PB running 24.9 in the Heat to qualify for the Final and came 7th there with 25.1, whilst Josh was just outside his PB running 27.3 in his Heat and going on to come 5th in the Long Jump with a distance of 4.09m. 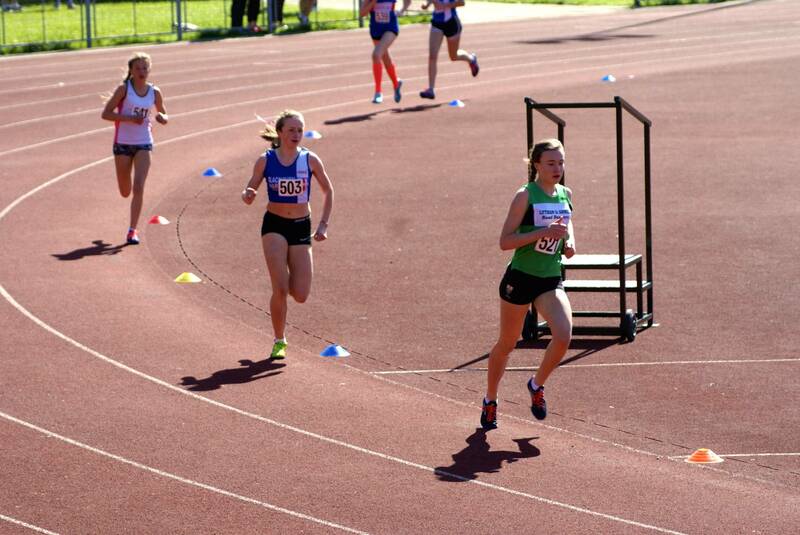 One more Medal came for Polly Pearse in the U20 Women’s High Jump when she finished 2nd with a clearance of 1.50m.